Cedars-Sinai focuses on biomedical research and technologically advanced medical education—based on an interdisciplinary collaboration between physicians and clinical researchers. The facility has research centers covering cardiovascular, genetics, gene therapy, gastroenterology, neuroscience, immunology, surgery, organ transplantation, stem cells, biomedical imaging and cancer—with more than 800 research projects underway (led by 230 principal investigators). Certified as a level I trauma center for adults and pediatrics, Cedars-Sinai trauma-related services range from prevention to rehabilitation and are provided in concert with the hospital's Department of Surgery. Cedars-Sinai is affiliated with the California Heart Center, University of Southern California and David Geffen School of Medicine at the University of California, Los Angeles (UCLA). As of 2017, U.S. News & World Report ranked Cedars-Sinai #4 in the western United States, with number one being the UCSF Medical Center. Cedars-Sinai also earned national rankings in 12 adult specialties including #5 for gastroenterology, #9 in cardiology and heart surgery, #9 in orthopedics, #10 in urology, #12 in gynecology, #14 in diabetes and endocrinology, and #14 in neurology and neurosurgery. Located in the Harvey Morse Auditorium, Cedars-Sinai's patient care is depicted in the Jewish Contributions to Medicine mural. The heart transplantation program at Cedars-Sinai Medical Center has experienced unprecedented growth since 2010. Statistically, Cedars-Sinai currently performs more annual heart transplants than any other medical center in the world, having performed 95 heart transplants in 2012 and 87 in 2011. Founded and financed by businessman Kaspare Cohn, Cedars-Sinai was established as the Kaspare Cohn Hospital in 1902. At the time, Cohn donated a two-story Victorian home at 1441 Carroll Avenue in the Angeleno Heights neighborhood of Los Angeles to the Hebrew Benevolent Society to create the hospital as a memorial to his brother Samuel. The hospital had just 12 beds when it opened on September 21, 1902, and its services were initially free. From 1906 to 1910, Dr. Sarah Vasen, the first female doctor in Los Angeles, acted as superintendent. In 1910, the hospital relocated and expanded to Stephenson Avenue (now Whittier Boulevard), where it had 50 beds and a backhouse containing a 10-cot tubercular ward. It gradually transformed from a charity-based hospital to a general hospital and began to charge patients. The hospital relocated again in 1930 to 4833 Fountain Avenue, where it was renamed Cedars of Lebanon after the religiously significant Lebanon Cedars, which were used to build King Solomon's Temple in Jerusalem in the Bible. Cedars of Lebanon could accommodate 279 patients. In 1918, the Bikur Cholim Society opened a second Jewish hospital, the Bikur Cholim Hospice, when the Great Influenza Pandemic hit America. In 1921, the hospice relocated to an eight-bed facility in Boyle Heights and was renamed Bikur Cholim Hospital. In 1923 the Bikur Cholim Hospital became Mount Sinai Home for the Incurables. On November 7, 1926, a newly named Mount Sinai Hospital moved to a 50-bed facility on Bonnie Beach Place. In 1950, Emma and Hyman Levine donated their property adjacent to Beverly Hills, and by 1955 the construction completed and Mount Sinai Hospital opened at 8700 Beverly Boulevard (now Cedars-Sinai Medical Center). Cedars of Lebanon and Mount Sinai Hospitals merged in 1961 to form Cedars-Sinai Medical Center. Donations from the Max Factor Family Foundation allowed the construction of the current main hospital building, which broke ground on November 5, 1972, and opened on April 3, 1976. In 1994, the Cedars-Sinai Health System was established, comprising the Cedars-Sinai Medical Care Foundation, the Burns and Allen Research Institute and Cedars-Sinai Medical Center. The Burns and Allen Research Institute, named for George Burns and his wife, Gracie Allen, is located inside the Barbara and Marvin Davis Research Building. Opened in 1996, it houses biomedical research aimed at discovering genetic, molecular and immunological factors that trigger disease. In 1994, the original building was damaged in the Northridge earthquake and demolished. In 2006, Cedars-Sinai added the Saperstein Critical Care Tower with 150 ICU beds. In 2008[update], Cedars-Sinai served 54,947 inpatients and 350,405 outpatients, and there were 77,964 visits to the emergency room. Cedars-Sinai received high rankings in 11 of the 16 specialties, ranking in the top 10 for digestive disorders and in the top 25 for five other specialties as listed below. In 2013, Cedars-Sinai Hospital was ranked in 12 specialties by U.S. News & World Report. Worth Magazine selected Cedars-Sinai Heart Institute as one of the United States' Top 25 Hospitals for Cardiac Bypass Surgery. Cedars-Sinai's Gynecologic Oncology Division was named among the nation's Top 10 Clinical Centers of Excellence by Contemporary OB/GYN in 2009. Keith Black, department chair of Neurosurgery and director of the Maxine Dunitz Neurosurgical Institute, has successfully performed over 4,000 brain surgeries and has made significant medical advances relating to neurosurgery. David Ho was a resident at Cedars-Sinai when he encountered some of the first cases of what was later labeled AIDS. Verne Mason, internist and chairman of the Howard Hughes Medical Institute's medical advisory committee. Mason gave the disease sickle cell anemia its name. David Rimoin, chair of Pediatrics for 18 years, specialized in genetics and was a pioneer researcher in dwarfism and skeletal dysplasia. Together with Michael Kaback, discovered the enzyme screening for Tay Sachs disease, reducing incidences of the deadly disease by 90 percent. William Shell was a director of Cardiac Rehabilitation at Cedars-Sinai. Esther Somerfeld-Ziskind, a neurologist and psychiatrist who was chair of the Department of Psychiatry. Adam Springfield, who acted on the PBS series Wishbone, is now a Labor and Delivery scheduler. Jeremy Swan co-invented the pulmonary artery catheter together with William Ganz while at Cedars-Sinai. July 11, 1937: Composer George Gershwin died of a brain tumor. May 29, 1951: Fanny Brice died of a cerebral hemorrhage. December 5, 1953: Jorge Negrete, Mexican actor, singer, important icon of Mexican culture, and important figure of Golden Age of Mexican cinema died from complications of liver cirrhosis. February 1, 1966: Hedda Hopper, gossip columnist and actress, died of pneumonia. May 5, 1972: Animator, comics artist, children's writer, illustrator, screenwriter, and film director Frank Tashlin died due to heart failure. December 20, 1973: Actor and singer-songwriter Bobby Darin died after a surgical team worked for over six hours to repair his damaged heart. May 4, 1975: Moe Howard, American actor and comedian, leader of the Three Stooges died of lung cancer. August 19, 1977: Actor and comedian Groucho Marx died of pneumonia. July 12, 1979: Singer-songwriter Minnie Riperton died of metastatic breast cancer. November 4, 1982: Actress Dominique Dunne died five days after being strangled by her former boyfriend. December 15, 1983: American film actress Eden Hartford died of cancer. May 16, 1984: Actor and entertainer Andy Kaufman died from renal failure that was related to lung cancer. December 10, 1987: Violinist Jascha Heifetz died from complications arising from a fall and subsequent neurosurgery. April 26, 1989: Actress and comedian Lucille Ball died of a dissecting aortic aneurysm. May 20, 1989: Saturday Night Live comedian Gilda Radner died of ovarian cancer. July 10, 1989: Mel Blanc, famed voice artist, died from cardiovascular disease. July 18, 1989: Actress Rebecca Schaeffer was shot at her home by stalker Robert John Bardo, and died a few minutes later in the hospital. February 24, 1990: Singer Johnnie Ray died of liver failure. July 21, 1991: Actor Theodore Wilson died of a stroke. November 10, 1992: Actor Chuck Connors died of lung cancer and pneumonia. October 31, 1993: Actor River Phoenix was pronounced dead at the hospital after a drug overdose at Johnny Depp's nightclub The Viper Room. February 23, 1995: Temptations bass singer Melvin Franklin died of heart failure after he was admitted following a series of seizures. March 26, 1995: Rapper Eazy-E succumbed to AIDS. He had been admitted to the hospital earlier and announced his condition publicly from the hospital. May 24, 1996: Actor John Abbott died of natural causes. October 28, 1996: Actor and comedian Morey Amsterdam died from a heart attack. March 9, 1997: Rapper The Notorious B.I.G., died as a result of four gunshot wounds to the chest and abdomen, suffering internal organ damage and blood loss. May 14, 1998: Singer and film actor Frank Sinatra died from a heart attack. August 2, 1998: Shari Lewis, puppeteer and star of Lamb Chop's Play-Along and Charlie Horse Music Pizza, died from uterine cancer and viral pneumonia. November 18, 1999: Television actress Beatrice Colen died of lung cancer. February 7, 2000: Magician Doug Henning died of liver cancer. July 15, 2001: Rapper Anthony Ian Berkeley, also known as Poetic, the founder of Gravediggaz, died of colorectal cancer. January 7, 2002: Actor Avery Schreiber died from a heart attack. February 24, 2003: Pastor E.V. Hill died after a severe pneumonia. July 4, 2003: Soul singer Barry White died due to kidney failure. July 12, 2003: Jazz musician Benny Carter died from complications of bronchitis. August 30, 2003: Actor Charles Bronson died after a severe pneumonia. November 12, 2003: Actor Jonathan Brandis died from injuries after a suicide attempt. February 8, 2004: Gang member Antoine Miller, one of several men who attacked Reginald Denny in 1992, died one week after being shot during an altercation outside a nightclub. January 23, 2005: The Tonight Show host Johnny Carson died of respiratory failure arising from emphysema. January 6, 2006: Musician Lou Rawls died of cancer. February 10, 2006: Record producer and rapper J Dilla died of a blood disease. February 24, 2006: Actor Don Knotts died from pulmonary/respiratory complications due to pneumonia that was related to lung cancer. August 13, 2006: Actor Tony Jay died due to complications from having a non-cancerous tumor removed from his lungs during a surgery. September 14, 2006: Bodybuilder and actor Mickey Hargitay died from multiple myeloma. January 8, 2007: Animator Iwao Takamoto died from a heart attack. January 27, 2007: Actress and producer Marcheline Bertrand died after an eight-year battle with ovarian and breast cancer. August 12, 2007: Merv Griffin, host of The Merv Griffin Show and creator of Jeopardy! and Wheel of Fortune, died of prostate cancer. October 30, 2007: Singer Robert Goulet died of idiopathic pulmonary fibrosis. August 24, 2007: Film producer and political activist Aaron Russo died of bladder cancer. November 11, 2007: Film and television director Delbert Mann died after a severe pneumonia. May 18, 2009: Rapper Dolla died after having been shot five times at the Beverly Hills Shopping Mall. August 21, 2009: Entrepreneur Frank Fertitta Jr. died from heart complications. December 20, 2009: Actress Brittany Murphy died from cardiac arrest due to pneumonia. March 23, 2011: Actress Elizabeth Taylor died from heart failure. April 11, 2011: Designer Bijan Pakzad died from a stroke. November 8, 2011: Rapper Heavy D died from complications from pneumonia after having collapsed outside his home. January 26, 2012: British actor Ian Abercrombie died from kidney failure. April 18, 2012: American film score composer Robert O. Ragland died after hospitalization. July 8, 2012: Actor Ernest Borgnine died from renal failure. September 3, 2012: Actor Michael Clarke Duncan died from heart complications. February 18, 2013: Owner of the Los Angeles Lakers Jerry Buss died at age 80 after having been hospitalized with an undisclosed form of cancer. His immediate cause of death was listed as kidney failure. October 14, 2014: Actress Elizabeth Peña died after a brief illness. January 5, 2015: Actress Francesca Hilton died after suffering a large stroke. January 9, 2015: American film producer Samuel Goldwyn Jr. died of congestive heart failure. December 31, 2015: Singer–songwriter, actress Natalie Cole died of congestive heart failure. February 4, 2016: Model Katie May died from a stroke. June 6, 2016: Actress Theresa Saldana died after a severe pneumonia. November 24, 2016: Actress Florence Henderson died from heart failure. December 28, 2016: Actress Debbie Reynolds died from a stroke, just one day after her daughter Carrie Fisher, the portrayal of Princess Leia from the Star Wars universe, had died. November 12, 2018: Comic-book writer Stan Lee died after he had been rushed to the hospital that morning. Donald Roulet, civil rights activist and head of the Roulet family, June 1, 1936. Daughter of rock musicians Kurt Cobain and Courtney Love, Frances Bean Cobain, August 18, 1992. Michael Jackson and Debbie Rowe's son, Michael Joseph Jackson Jr, February 13, 1997. Fernando and Myrna Lorenzo's son, Fernando, June 17, 1997. Madonna and Guy Ritchie's son, Rocco John Ritchie, August 11, 2000. Mark Wahlberg and Rhea Durham's eldest daughter, Ella Rae on September 2, 2003, oldest son, Michael on March 21, 2006, youngest son, Brendan Joseph on September 16, 2008, and youngest daughter, Grace Margaret on January 11, 2010. Kate Hudson's eldest son, Ryder Russell Robinson on January 7, 2004 (with ex-husband Chris Robinson), youngest son, Bingham Hawn Bellamy on July 9, 2011 (with ex-fiancé Matt Bellamy), and daughter, Rani Rose Hudson Fujikawa on October 2, 2018 (with boyfriend Danny Fujikawa). Britney Spears and Kevin Federline's first son, Sean Preston, September 14, 2005. Their second son, Jayden James, September 12, 2006. Mariska Hargitay and Peter Hermann's eldest son, August Miklos Friedrich Hermann, June 28, 2006. Tori Spelling and Dean McDermott's eldest son, Liam Aaron on March 13, 2007, oldest daughter, Stella Doreen on June 9, 2008, youngest daughter, Hattie Margaret on October 10, 2011, second son, Finn Davey on August 30, 2012, and youngest son, Beau Dean on March 2, 2017. Salma Hayek's daughter, Valentina Paloma Pinault, in September 21, 2007. Nicole Richie and Joel Madden's daughter, Harlow Winter Kate on January 11, 2008 and son, Sparrow James Midnight on September 9, 2009. Crown Prince Pavlos and Marie-Chantal's son, Aristidis-Stavros, June 29, 2008. Ashlee Simpson and Pete Wentz's son, Bronx Mowgli Wentz, November 20, 2008. Kourtney Kardashian's eldest son, Mason Dash on December 14, 2009, daughter, Penelope Scotland on July 8, 2012, and youngest son, Reign Aston on December 14, 2014 (with ex-boyfriend Scott Disick). Miranda Kerr and Orlando Bloom's son, Flynn Christopher Blanchard Copeland Bloom, January 6, 2011. Victoria Beckham and David Beckham's daughter, Harper Seven Beckham, July 10, 2011. Mel B's youngest daughter, Madison Brown Belafonte, September 1, 2011. Jessica Simpson and Eric Johnson's daughter, Maxwell Drew on May 1, 2012 and son, Ace Knute on June 30, 2013. Molly Sims and Scott Stuber's elder son, Brooks Alan Stuber, June 19, 2012. Chris Pratt and Anna Faris' son, Jack Pratt, August 25, 2012. Kim Kardashian and Kanye West's eldest daughter, North West on June 15, 2013, second child and son, Saint West on December 5, 2015, and youngest daughter, Chicago West (via a surrogate) on January 15, 2018. Jimmy Kimmel and Molly McNearney’s son, William “Billy” John Kimmel, April 21, 2017. Paulina Gretzky and Dustin Johnson's first son, Tatum Gretzky on January 19, 2015 and second son, River Jones on June 12, 2017. Rob Kardashian and Blac Chyna's daughter, Dream Renée Kardashian, November 10, 2016. Beyoncé and Jay-Z’s twins, Rumi and Sir Carter, June 13, 2017. Kylie Jenner and Travis Scott's daughter, Stormi Webster, February 1, 2018. Chiara Ferragni and Fedez's son, Leone, March 19, 2018. Eva Longoria's son, Santiago Enrique Bastón, June 19, 2018. According to articles in the Los Angeles Times in 2009, Cedars-Sinai was under investigation for significant radiation overdoses of 206 patients during CT brain perfusion scans during an 18-month period. Since the initial investigation, it was found that GE sold several products to various medical centers with faulty radiation monitoring devices. State regulators had also found that Cedars-Sinai had placed the Quaid twins and others in immediate jeopardy by its improper handling of blood-thinning medication. In 2011, Cedars-Sinai again created controversy by denying a liver transplant to medical marijuana patient Norman Smith. They removed Mr. Smith from a transplant waiting list for "non-compliance of our substance abuse contract", despite his own oncologist at Cedars-Sinai having recommended that he use the marijuana for his pain and chemotherapy. Dr. Steven D. Colquhoun, director of the Liver Transplant Program, said that the hospital "must consider issues of substance abuse seriously", but the transplant center did not seriously consider whether Mr. Smith was "using" marijuana versus "abusing" it. In 2012, Cedars-Sinai denied a liver transplant to a second patient, Toni Trujillo, after her Cedars-Sinai doctors knew and approved of her legal use of medical marijuana. In both cases, the patients acceded to the hospital's demand and stopped using medical marijuana, despite its therapeutic benefits for them, but were both sent six years back to the bottom of the transplant list. His death inspired Americans for Safe Access to lobby for the California Medical Cannabis Organ Transplant Act (AB 258), which was enacted in July 2015 to protect future patients from dying at the hands of medical establishments prejudiced against the legal use of medical cannabis. On June 23, 2014, an unencrypted employee laptop was stolen from an employee's home. The laptop contained patient Social Security numbers and patient health data. On June 18 through June 24, 2013, six employees were terminated for inappropriately accessing 14 patient records around the time Kim Kardashian and Kanye West's daughter was born at the hospital. First developed by philanthropists Frederick and Marcia Weisman, Cedars-Sinai's modern and contemporary art collection dates to 1976 and includes more than 4,000 original paintings, sculptures, new media installations and limited-edition prints by the likes of Andy Warhol, Robert Rauschenberg, Richard Diebenkorn, Sam Francis, Claes Oldenburg, Willem de Kooning, Raymond Pettibon and Pablo Picasso. Ninety to 95 percent of the collection is on display at any given time. Nine large-scale works are located in courtyards, parking lots and public walkways throughout the approximately 30-acre campus. The collection consists entirely of gifts from donors, other institutions and occasionally the artists themselves. ^ "Locations & Directions". Cedars-Sinai. Retrieved 2017-07-22. ^ "Beverly Grove Profile - Mapping L.A." Los Angeles Times. Retrieved 2017-07-22. ^ "Bulletin of the National Center for Healthcare Leadership" (PDF). Modern Healthcare. 2007. Archived from the original (PDF) on 2010-03-31. Retrieved 2010-06-15. ^ Roehr, Bob (2007). "Suspension of Privileges Improves Physician Adherence to Hand Hygiene". WebMD. Retrieved 2010-06-15. ^ "100 Best Places to Work in IT in 2009". Computerworld. 2009. Retrieved 2010-06-15. ^ "Cedars-Sinai - A Non-Profit Hospital in Los Angeles". www.csmc.edu. Retrieved 23 June 2017. ^ "Cedar-Sinai Medical Center Web site — Discoveries". cedars-sinai.edu. Retrieved 23 June 2017. ^ "Research". www.cedars-sinai.edu. Retrieved 23 June 2017. ^ "Clinical Trials - Cedars-Sinai". www.cedars-sinai.edu. Retrieved 23 June 2017. ^ "Trauma Program". www.cedars-sinai.edu. Retrieved 23 June 2017. ^ "U.S. News Best Hospitals 2013–14". U.S. News & World Report. 2013-10-16. ^ "History of Cedars-Sinai". www.cedars-sinai.edu. Retrieved 23 June 2017. ^ McGroarty, John Steven (1921). Los Angeles From the Mountains to the Sea. p. 777. Retrieved 2010-06-20. ^ a b c d e f Aushenker, Michael (October 3, 2002). "From TB to T-Cell, Tracing the Roots of Cedars-Sinai". The Jewish Journal. Retrieved 2017-07-07. ^ Beardsley, Julie (April 2003). "Dr. Sarah Vasen: First Jewish Woman Doctor In Los Angeles; First Superintendent Of Cedars-Sinai Hospital". Retrieved 2008-02-21. ^ a b c d e f Encyclopaedia Judaica (2008). "Los Angeles". Retrieved 2010-06-23. ^ "Cedars-Sinai - A Non-Profit Hospital in Los Angeles" (PDF). www.csmc.edu. Retrieved 23 June 2017. ^ "Cedars of Lebanon hospital". ucla.edu. Archived from the original on 16 July 2012. Retrieved 23 June 2017. ^ "Historical Perspective" (PDF). Cedars-Sinai Medical Center. July 2003. Archived from the original (PDF) on 2007-11-28. Retrieved 2008-02-21. ^ "IDC Case Study" (PDF). IDC. 2008. Retrieved 2010-07-01. ^ "Ninety-eight-year-old George Burns Shares Memories of His Life". Cigar Aficionado. 2010. Archived from the original on 2010-03-07. Retrieved 2010-07-01. ^ a b Reports, From Times Staff (11 September 2003). "Huge Donation to Fund Tower at Cedars-Sinai". Retrieved 23 June 2017 – via LA Times. ^ Helfand, Duke (28 November 2010). "How I Made It: Thomas M. Priselac of Cedars-Sinai Health System". Retrieved 23 June 2017 – via LA Times. ^ REICH, KENNETH (18 July 1996). "$264 Million OKd for Quake Repair". Retrieved 23 June 2017 – via LA Times. ^ REICH, KENNETH; RABIN, JEFFREY L. (12 March 1996). "3 Hospitals to Receive $459 Million in Quake Aid". Retrieved 23 June 2017 – via LA Times. ^ "Our Report To Our Community, 2008" (PDF). Cedars-Sinai Medical Center. 2008. Retrieved 2009-10-26. ^ a b "America's Best Hospitals". U.S. News & World Report. 2009. Retrieved 2009-10-26. ^ "Advanced Health Sciences Pavilion Wins Award from American Institute of Architects California Council". 2013-09-11. Retrieved 2013-09-25. ^ Cedars-Sinai (11 December 2015). "Fly Protocol - Cedars-Sinai". Retrieved 23 June 2017 – via YouTube. ^ Cedars-Sinai (5 June 2014). "Swan-Ganz Catheter - Cedars-Sinai". Retrieved 23 June 2017 – via YouTube. ^ Cedars-Sinai (9 June 2014). "Volunteer Uniforms - Cedars-Sinai". Retrieved 23 June 2017 – via YouTube. ^ Cedars-Sinai (5 June 2014). "Moses Statue - Cedars-Sinai". Retrieved 23 June 2017 – via YouTube. ^ Cedars-Sinai (11 December 2015). "Can You Spare A Dime - Cedars-Sinai". Retrieved 23 June 2017 – via YouTube. ^ Cedars-Sinai (11 December 2015). "A Hen House in the Hospital - Cedars-Sinai". Retrieved 23 June 2017 – via YouTube. ^ Cedars-Sinai (6 June 2014). "Art Collection - Cedars-Sinai". Retrieved 23 June 2017 – via YouTube. ^ Cedars-Sinai (5 June 2014). "10 Commandments - Cedars-Sinai". Retrieved 23 June 2017 – via YouTube. ^ "Cedars-Sinai Medical Center". U.S. News & World Report. 2013. Retrieved 2013-10-16. ^ Documents "2009/2010 Consumer Choice Winners" Check |url= value (help). National Research Corporation. 2009. Retrieved 2009-10-26. ^ "ELITE LIST: Top 25 Hospitals for Bypass Surgery". Sandow Media. December 2009. Retrieved 2010-07-05. ^ Brower, Amanda (2009). Documents "Gynecologic Oncology Clinical Centers of Excellence" Check |url= value (help). Advanstar Communications. Retrieved 2010-07-05. ^  at Cedars-Sinai official website. ^ "Media Advisory" (PDF). Cedars-Sinai Medical Center. 2002. Archived from the original (PDF) on September 12, 2006. ^ "Jewish Journal". Jewish Journal. 29 May 2012. ^ "Targeted Medical Pharma Inc". www.marketwatch.com. Retrieved 23 June 2017. ^ "Cedars-Sinai Medical News" (PDF). Cedars-Sinai Medical Center. 19 May 2003. Archived from the original (PDF) on September 12, 2006. ^ "Violin Master Jascha Heifetz Dies". tribunedigital-sunsentinel. Retrieved 2016-01-16. ^ report, Rick Kogan, Tribune Staff Writer Tribune news services contributed to this. "PUPPETEER SHARI LEWIS, 65, CREATOR, VOICE OF LAMB CHOP". chicagotribune.com. ^ "John Avildsen, Oscar-Winning Director Of 'Rocky' And 'Karate Kid,' Dies At 81". Npr.org. Retrieved 23 June 2018. ^ Gates, Anita (September 15, 2017). "Harry Dean Stanton, Character Actor Who Became a Star, Dies at 91". The New York Times. ^ "Stan Lee, Marvel Comics' Real-Life Superhero, Dies at 95". The Hollywood Reporter. ^ BOYLE, CHRISTINA. "Christina Aguilera gives birth to boy - NY Daily News". nydailynews.com. ^ Rivera, Zayda. "Christina Aguilera, fiancé Matt Rutler welcome baby girl Summer Rain: report - NY Daily News". nydailynews.com. ^ Zarembo, Alan (2009-10-14). "Cedars-Sinai radiation overdoses went unseen at several points". Los Angeles Times. Retrieved 20 January 2010. ^ Charles Ornstein. "Quaids recall twins' drug overdose". Los Angeles Times. Retrieved 20 January 2010. ^ "Letter from Brenda Durand, RN, Liver Transplant Clinical Coordinator at Cedars-Sinai, to Norman Smith" (PDF). February 1, 2011. Archived from the original (PDF) on December 25, 2011. Retrieved February 29, 2012. ^ Anna Gorman (December 3, 2011). "Medical marijuana jeopardizes liver transplant". Los Angeles Times. Retrieved 2012-02-29. ^ Kathleen Miles (December 5, 2011). "Norman Smith: Cancer Patient Taken Off Of Liver Transplant List Because Of Medical Marijuana Use". The Huffington Post. Retrieved 2012-02-29. ^ "Second Medical Marijuana Patient Denied Transplant by Cedars-Sinai in the Last Year". Americans for Safe Access. June 11, 2012. Retrieved 2012-06-16. ^ Kris Hermes (August 9, 2012). "Medical Marijuana Patient Norman Smith Passes, But Not Without a Fight". Americans for Safe Access. Retrieved 2012-08-10. ^ Katie Orr (July 6, 2015). "Law Eases Organ Transplant Process For Medical Marijuana Patients". Capital Public Radio. Sacramento, CA. ^ "Cedars-Sinai Medical Center website – Cedars-Sinai Health System Issues Notice of Data Incident". Retrieved 2014-09-08. ^ "Los Angeles Times – Six people fired from Cedars-Sinai over patient privacy breaches". Retrieved 2014-09-08. 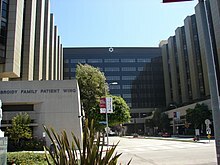 Wikimedia Commons has media related to Cedars-Sinai Medical Center. "Articles about Cedars Sinai Medical Center". latimes.com. Retrieved 23 June 2017.